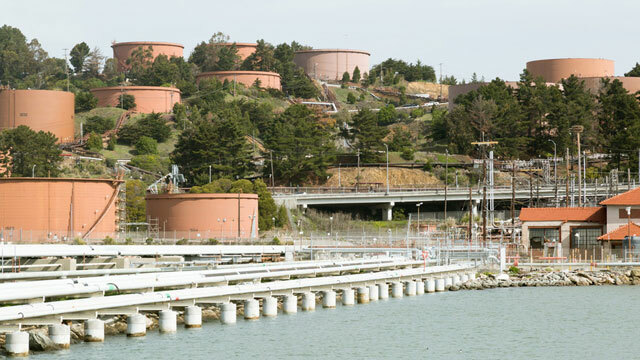 The small fire that ignited at Chevron's Richmond refinery last month is being ruled an accident. The fire started early in the morning on July 16, and firefighters put it out in about an hour. In their report, Chevron investigators explain that the fire started during steam cleaning of a part of the refinery's fluid catalytic cracker. That's the part of the refinery that breaks large crude oil molecules down into smaller, more valuable ones, like gasoline and jet fuel. During the cleaning process, a valve leaked and hot crude oil leaked into a temporary hose, which failed. The oil was hot enough to catch fire without being exposed to any flames. The company's investigators recommend that in the future, workers doing maintenance in that part of the refinery use hard pipes instead of hydrocarbon hose. "Them using these hydrocarbon hose lines to steam the process out is normal standard practice throughout the refinery -- and refineries," said Eric Govan, an inspector with the Richmond Fire Department who is doing a separate investigation of the fire. Govan said his findings, which he expects to complete next week, are similar to Chevron's. "Chevron doesn't want these fires happening any more than we do, any more than the citizens in the community of Richmond does," he said. "So I think moving forward we'll come to an agreement so these types of incidents don't happen again." Govan is one of two city fire inspectors now based at Chevron's refinery. That's a change, implemented earlier this summer, that came out of the large fire at Chevron in 2012. "It's certainly a goal that we both have that we don't want these kind of events to continue," said Richmond Fire Chief Michael Banks. The Bay Area Air Quality Management District is also conducting an investigation, to ensure that the fire was not caused by any missed maintenance. There were no health warnings following this fire, and since no workers were injured or exposed, Cal-OSHA is not investigating.